DiamondFire racing ignition products are designed for performance. There is a reason why you love motorsports but the wrong ignition system won't get the job done at the track. Our ultra durable racing ignition box, racing distributors, racing ignition coils, racing O2 sensors and racing wire sets will work with your E3 Spark Plugs to produce the power you need, when you need it. Our DiamondFire designs are developed at the track to deliver E3 racing ignition products that are Born to Burn. In fact, our broad range of participation in motorsports allows E3 Spark Plugs to deliver the most technologically advanced line of performance products in the industry. It is widely know that most factory coils are weak and can suffer from reliability issues under the pressure of motorsports competition. DiamondFire racing ignition coils are engineered to deliver the maximum voltage for all performance applications. Typical responses heard at tracks across the country from those who using our racing ignition products include improved engine response, superior arc protection, easy access, better throttle response, smoother operation, and maximum conductivity with no more misfires. 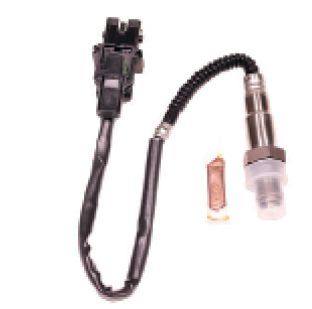 Don't wait for problems to arise before making improvements to your ignition system. Click the green SHOP button at the top of any page or ask for E3 racing spark plugs and racing ignition products at your favorite speed shop. 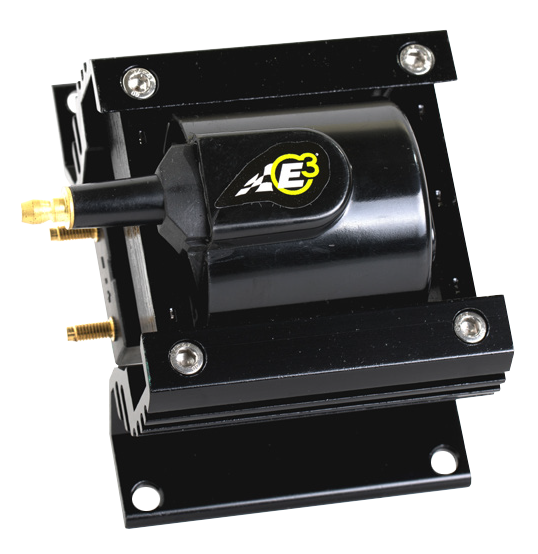 E3's new DiamondFIRE 6CDI Digital Capacitive Discharge Racing Ignition Box features high performance digital microprocessor-controlled circuitry contained in a lightweight extruded housing. Boasting a highly efficient design, the DiamondFIRE 6CDI outperforms other 6 series boxes on the market today. 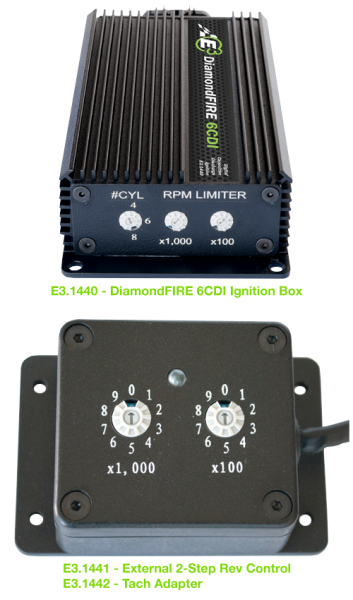 The ultra-durable DiamondFIRE 6CDI racing ignition box comes complete with wiring harness, hardware and mounting kits. It is compatible with even-fire 4, 6, and 8 cylinder engines and 12-volt negative ground electrical systems. It will accept input trigger signals from break points, breakerless electronic modules as well as magnetic distributor or crank trigger pickups. The box is not designed for systems with Hall Effect pickups. Drag racer? E3's External 2-Step Rev Control enables you to set a lower rev limit when in the starting and staging lanes. Two easy to read rotary dials allow you to set the staging rev limit in 100 RPM increments. A bright LED indicator lets you know the unit is on and functioning even in low light conditions. This product requires the use of E3.1440 DiamondFIRE 6CDI. Top mounted racing distributors for easy access, the race proven adjustable mechanical advance features a cam plate and weights that are precision stamped and blanked for precise accuracy of dimension and balance. We TIG welded the cam plate to the top of the shaft assembly for reliable performance and long term durability, and the weight pivot pins are stacked and TIG welded in place. The whole assembly receives a proprietary nitrocarburized treatment, which strengthens and hardens the surface, while reducing friction and providing a corrosion resistant finish. The cam plate features nylon rub pads which the weights ride on; ensuring long term smooth advance movement. Each distributor comes with three sets of advance springs and four stop bushings, so you can customize the advance curve to your specific application. Our high output magnetic pickup is engineered specifically for racing and is bolted to the base of the distributor. The shaft mounted paddle wheel reluctor has been finely tuned to enable the whole system to generate an accurate trigger signal at all RPM levels, even up to redline. Our centerless ground shaft rides on an upper sealed roller bearing with an extra-long lower bronze Oil-Lite bushing for smooth operation at high RPM's. It's also polished before receiving our proprietary friction reducing coating, to ensure smooth and reliable operation up to 10,000 RPM as well as a much longer service life than other distributors with steel or polymer bushings. All DiamondFIRE racing distributors feature CNC machined 6061-T6 heat treated aluminum housings. A special hot forging process goes beyond a normal billet process to ensure there are no weak spots or porosity while producing the strongest possible flex free spots. This process ensures accurate machined tolerances and a great looking finish on the distributor. Molded in high quality 30% glass filled polyester (PBT), the cap, rotor and wire retainer offers high impact, dielectric strength, and resists carbon tracking. The cap contacts are brass while the rotor spring is stainless steel. Our racing distributors are designed to deliver long term maximum conductivity. E3 manufactures a variety of high performance coils specifically designed for motorsports applications. Whether or not they are stand-alone coils, like our DiamondFIRE High Output CD Racing Ignition Coils, or coil near plug applications for LS motors or the ultrahigh output HEMI COP, all E3 ignition racing coils are engineered to deliver the maximum voltage for all performance applications. All E3 racing ignition coils are manufactured to the strictest tolerances to ensure trouble free operation regardless of whether you have a stock Camaro SS or a 1,500 horsepower Mustang. Whether you road race, drag race or turn left on an oval track, E3's High Performance Racing 02 Sensor is specially designed to withstand the ultra-harsh environment of motorsports competition. Our Racing O2 Sensor delivers improved engine response, longer sensor life and reliable performance lap after lap. These DiamondFIRE 8.5mm racing wire sets are designed to maximize the power of E3 Spark Plugs DiamondFIRE Technology. Sporting a Class F40 Spiral Conductor and rated at just 40 Ohms per foot, the 8.5mm silicone outer jacket encases a silicone inner jacket with stainless steel terminals. All racing wires sets are build to suit with all the necessary components. The distributor end comes unassembled, but includes multiple terminals for different applications. Boots are available in straight or 90 degree configurations.